Leaders of eight armed groups yesterday signed a Nationwide Ceasefire Accord (NCA) with the Myanmar government that could end decades of sporadic, debilitating civil wars in a country making a fragile transition to democracy. The groups already have bilateral ceasefires with the government, but the NCA is much broader and lays down a timeline for a political dialogue in the months ahead. Though China and the United Nations had been the only formal observers to the three years of negotiations, representatives of special envoy or ambassador status from India, Japan, Thailand and the European Union joined them to sign the NCA as "international witnesses". Sources said there was some diplomatic jostling as, underlining Myanmar's geostrategic significance, China tried to keep Japan and the EU - both heavily invested in the peace process - out of the "international witnesses" group. President Thein Sein, vice-presidents Sai Mauk Kham and U Nyan Tun, armed forces chief Min Aung Hlaing and his deputy, army chief Soe Win, and Speakers of the two Houses of Parliament signed on behalf of the government. The groups that signed, including one of the biggest - the Karen National Union - have been removed from the government's list of "unlawful associations". But with powerful groups like the Kachin Independence Organisation and the United Wa State Army staying out, critics see the NCA as half-baked. Only eight out of the 16 groups that had agreed to the draft in March eventually signed. Some had been suspicious the NCA was a plot to split them; they had argued the government should sign with all or none, but the government did not negotiate with some groups including the Kokang, with which it is at war. Even now, despite efforts to build trust, distrust runs deep. There are ongoing clashes between one of the holdout groups, the Shan State Army, and Myanmar's army. The accord's success depends on tangible results. The NCA commits all sides to notify their ranks within one week of the articles in the agreement. A Joint Monitoring Committee has to be set up in 40 days, followed by a framework for political dialogue within 60 days. Both will be complex and prickly and further complicated by a Nov 8 General Election and a new government early next year. Still, there are huge expectations, and the ball is in the court of the government and the army to meet them, Yangon-based independent analyst Richard Horsey said. As the government's chief negotiator, Cabinet minister Aung Min wrote in a commentary on the eve of the signing: "The NCA is the first small step towards bringing our fractured society of many different ethnicities and religions into a dialogue to shape the future of our country on equal terms." On the significance of the NCA, Dr Horsey said on the phone from Naypyitaw that it shows how far the discussion on building a new consensus around the future of the country had come. In an e-mail to The Straits Times, Professor David Steinberg from Georgetown University in Washington, DC, wrote that the NCA was "a balanced document and covers the concerns" but noted it was the first step on a "tortuous" road ahead. 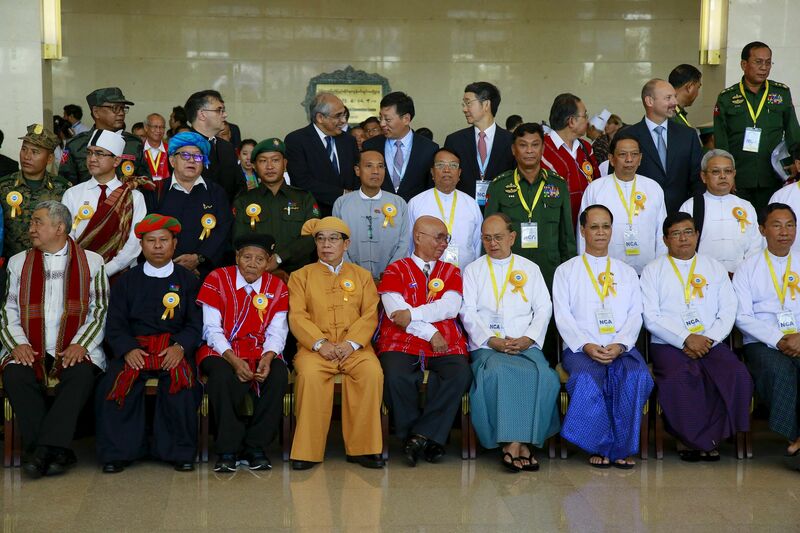 At the ceremony in the Myanmar International Convention Centre in Naypyitaw, the symbolism was strong. Among the over 1,000 invitees were old enemies - former political prisoners, army generals and elderly ethnic leaders - noted historian Thant Myint U. "Nobody should underestimate that," he said. "Everyone appreciates that it has been an uphill climb. Some of these people have been fighting (one another) for their entire lives."